I can get lead blocks about 5 lb each. They are about2.5 in x 4x 6. Just guessing. They are cfrom the hospital where I work. How do i ck the hardness or find out what lead they are pure soft or whatever? Would they be anything other than pure lead? I picked up some lead pipes that were used for shielding some type of wiring. I could tell by handling and looking at it that it look like pure lead. It comes from an unknown source for me, as I bought it at the junk yard. I bought 250 lbs, should of bought it all. You can use your thumb nail, but if you have never tried pure lead before then that is meaningless. I can scrape a line in it with my thumb nail. I dont think it has been used for anything yet. It has been at the hospital for many years. Could I make some balls with if and do some type of hardness test? with what it should be in pure lead. We can help with that determination. If there is any tin or antimony in it, they will be lighter than they should. a ball, weigh it & measure it and we will know for sure. Net about this test and which pencils to use. Get one of the ingots,pour some balls,and go shoot them, If they do all you want go get some more ingots, pour some more balls and go shoot them. All the scratch,taste, sniff testing is of no use if what you are testing does not work for you. Pour some shoot some and see. What's an air cooled wheel weight? Wheelweight alloy that has been allowed to air cool after casting rather than dropping it into water bath to quench. LOL..I was thinking of what it meant on the wheel. a great deal to do with this. same, due to the arsnic in their composition. IIRC 1% is about all that is needed. Pure lead and tin alloys, nor straight PB(lead) and antimony mixes will water harden. water, with a folded towel at the bottom. The balls or bullets will still be soft, so at this time, immediately lubricate them. Over the course of 11 to 12 hours they will harden as they sit at room temperature, to upwards of 30 to 34 brinel. If they are sized and lubed after they are hard, the surfaces "worked" will soften- thus, sizing and lubing immediately after quenching is necessary. 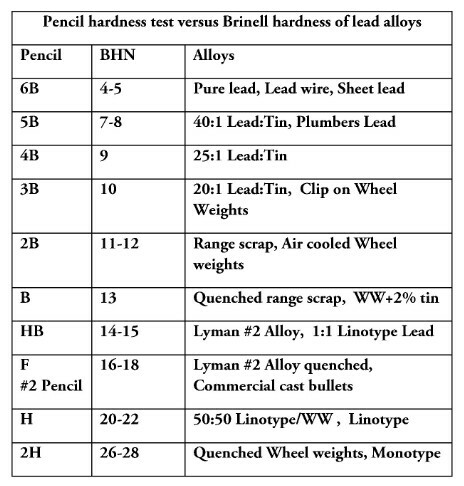 Cast bullets or balls hardened this way, can be made harder than any other method of mixture of lead, tin or antimony. Dead soft copper has a brinel of 34/35. I have been 'doing this' hardening and shooting hardened cast bullets since about 1978.
my lead testing is cast, weigh, shoot, see. with properly lube patched balls, the bore is protected. the rest is up to consistently cast balls with no voids and their consistent accuracy. where hunting is concerned, it's a matter of expansion versus penetration, and this is where ball hardness and weight might matter. choose aptly for the type of game hunted. I generally use lead pipe less the soldered joints. Was given some lead from the telephone company. This stuff passed the thumb nail test, in use it loaded hard. I placed it against a Hornady ball in the vice, it imbedded in the Hornady ball without deforming. Sounds like radiation shielding. That is premium stuff, get all you can. I agree with Scota, several years ago I got about 800# of the stuff from a hospital remodeling sight. I had to clean it up, there was a layer of oily paper on it but it produced some of the best round balls I have ever cast. Scota has the idea. I compare lead that I am considering buying to a known source. You can take a lead ball that you know is soft enough and squish it against a ball unknown hardness. The softer lead will give way to the harder lead. You need to compare pieces of equal structure as I believe a .530 ball might squish a .310 ball even if the bigger one is softer. Once you get the hang of it you can squish just one ball in a channel lock pliers and you'll get an idea how much you can squish pure lead. If I cast from sewer lead I can sqish a .530 ball to look like chewn bubble gum. If I cast from wheel weights I can sink the teeth of the pliers, but it will remain round. Hospitals sometimes have lead 'boxes' in which they store and ship radio isotopes. They are pure lead. Just drop it on a hard surface, soft lead will have a dull thud. If it has a alloy it will ring with a metallic sound, plus the fingernail test is a good way to go.